Education: Does A Child Know What Is Good For Him? Question: In recent years, the education of children has changed very much. In the past, parents gave instructions to their children, and if a child refused to maintain their requirements, he was punished. Today, every parent is reconsidering his attitude toward the child, trying to build another connection with him. However, for the most part, the child doesn’t always understand what is good and what is bad for him. What do you think in connection to this? How much are parents like these on the right path? Answer: If parents want their child to grow up, they need to create an appropriate environment for him, a social environment in which even a three-year-old child will get particular signals from the environment, awakening in him some kind of conscious, purposeful action, and then he will develop the way they want, whereas this way, just in an empty place, in a vacuum, where the father and mother don’t require anything and don’t explain anything, the child himself doesn’t know what is what. So, from where would he get the appropriate guidance? He necessarily must communicate. In childhood, this is the most important thing. In the first two years of life, he doesn’t feel others at all, only himself, and can cooperate mutually only with the nature of the still, vegetative, and partially with the nature of the animate. After that, an aspiration for mutual cooperation with other children appears, and sometimes with adults. Then, we must think about an environment. So, the parents should not let it go; “He should think and do things by himself.” What does “by himself” mean? They apparently suspend the child in a vacuum. What the parents first complete for him, now friends, adults and the entire, immense world must complete. On Monday evening, July 20th, I gave a lecture at the Jewish Center Rigo Park in Queens, New York on what brings people to separate the Jews, and what the solution is for the sharp rise in anti-Semitism. 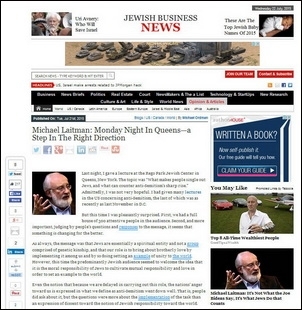 My article on the subject was published in the Jewish Business News journal. In contrast to the reservations and mixed feelings I encountered in lectures about the role of the Israeli nation that I gave in the US in the past, I was surprised by the change I felt in the audience and their readiness to listen and accept the approach I presented. I don’t take credit for this achievement since we first must thank anti-Semitism for making the Jewish nation ready to listen and hear about the unique and critical mission that they must fulfill in uniting all of humanity. There is a lot to be done, of course, but the first step toward any change begins with a change in awareness, and I believe that the change in our awareness already is taking place. If this lecture signifies anything about the future of American Jews, I think it is definitely a step in the right direction. We are in a special time now called Bein Hameitzarim, the three weeks from the 19th of Tamuz until the ninth of Av. This period is known throughout history as difficult times for the nation of Israel, but let’s hope that, this year, we will be able finally to correct it so that this period no longer will bring about different disasters as in the past. Question: How can unfortunate events be related to a certain time? Answer: Everything that happens in our world stems from the hidden of forces of nature that we don’t feel. We only feel the outcome of their actions, but we actually don’t reveal these forces. If we speak about electricity, for example, it means that we see how different electrical appliances work or someone gets an electrical shock. Thus, we find that the network has power. This is also how we discover the force of gravity, according to the outcome of its actions. If an apple falls on my head, I can say that there is a special force that is called the force of gravity. We never discover the actual forces. There is an entire network of forces around us, starting from subatomic forces inside tiny atoms and molecules and ending with cosmic forces that operate between the stars and the planets in the universe. Everything that we see is a result of the actions of different forces. Every force can be discovered only according to the outcome of its influence on matter. Why does the earth revolve? It means that there is a force that revolves it. All of the planets revolve as a result of a network of forces that set these cosmic objects in motion. However, we need the wisdom of Kabbalah in order to discover the actual forces because it tells us about the forces that are behind matter, including the forces that are behind man, forces that manage the calendar. We can see all of the forces behind each day and behind each revolution of the earth on its axis and every revolution it makes around the sun. Humanity has accumulated data from different experiments and has made tables as in any scientific field, according to which this period is considered especially unfortunate. However, the wisdom of Kabbalah is called the wisdom of truth because it tells us the reason for everything that happens. It tells us why the calendar is arranged this way, why the earth revolves around the sun, and why man was created this way and how he is related to others. If we discover a certain phenomenon, we investigate it through ordinary scientific tools. The wisdom of Kabbalah, on the other hand, tells us about hidden phenomena and forces, and therefore is called the concealed wisdom, the secret wisdom, since it tells us the secrets of creation. Opinion (David Servan-Schreiber): “Helping others activates areas in the brain that stimulate a feeling of pleasure in us. So specifically because of this in difficult times we must put emphasis on communication between people. “A nation that dedicates itself to the growth of its Gross National Product, interprets all measurements in monetary units. But it is impossible to measure the health of children, happiness, singing, stable married life, the honesty of those in power, humor, education, wisdom and love with money. The Gross National Product of the nation measures everything, but just not those aspects for which it is truly worthwhile to live. “The positive development of a nation doesn’t need to be measured by the growth in the manufacture of weapons and the building of prisons, rather through the true welfare of its citizens. People are happy when their jobs are not connected to consumption. Creating a connection with others, being active, concentrating on shared events, learning all the time, trying something new and devoting yourself to others; this is the formula for happiness! Question: Is war a search for connection between people? Answer: When people cannot reach agreement between them, they don’t just distance themselves from each other, but begin all kinds of conflicts. This means that if there is not a good connection, it becomes a bad connection. So, both civil wars and wars between nations are a search for some kind of connection, either good or bad, but all of us are egoists. We cannot determine some kind of defined general rules between us, some kind of connecting formula. and war helps us with this. The fact that in the 20th century wars became international indicates that the entire world is searching for union because it must reach a global state, back to its roots. Question: But humanity assumes the opposite, that war is a severing of connection. Answer: No, along with this, some kind of particular transformation of order happens. We Jews, unfortunately, are a type of egoist such that we still are not ready to move from ego to union immediately. The connection between all of the peoples who are in conflict must be discovered as a result of our work. If the people of Israel won’t show an example of connection and union, then only one thing is left: war. Then, all of the people blame us that all of the wars in the world happen because of the Jews. And this is correct because we aren’t making it possible for them to unite among themselves. This is because the glue that connects all of humanity together, which is the characteristic of bestowal and love, is only found with us. Question: Today, one in a hundred children suffers from autism. What is this autistic world from the point of view of the wisdom of Kabbalah? How is it possible to peer into it? How is it possible to understand these people? Answer: The human soul is a diverse and multileveled phenomenon. Probably there is a classification of children as autistic according to some external and internal signs, according to tests and so forth. However, in my perception of humanity and reality in general, I would not consider these people as separate from others, for after all, we all are autistic to some degree. In some way, we are normal, in some way geniuses, and in some way completely stupid, peasants, workers, freemen, masters and servants. This is to say, in every person, everything is found in different combinations. Everything depends on the integration of the autistic people in the surrounding environment because the environment is the main thing that differentiates us most from other people. So, I think that we simply have not yet found the right method with whose help it would be possible to connect autistic people with regular people. Autism is a social problem of the relationship with the environment. If the right environment is created around the child—a group or friends to organize successful interactions with older children who know how to behave—then I am sure that it is possible to bring the child out of any state because the influence of the environment, especially on the autistic person, provides an immense effect. I don’t know what medications specialists use, but in my perception and understanding, the right purposeful influence, not only on a child but on any person, is able to move him into any state. It can make any normal person autistic, and vice versa. Moses’s arguments persuaded Jethro to leave his children in the camp of the Jews. The grandchildren of Jethro entered the land of Israel, and as Moses promised, they received the fertile lands of Jericho and its surroundings. Ultimately, they became prominent masters of knowledge in Torah. The descendants of Jethro became famous as the leaders of the Sanhedrin, teaching Torah to the entire community of Israel (Midrash Mesaper, Parshat Beha’alotcha). Those among the nations of the world who had the greatest egoistic desires and succeeded in correcting them became the greatest of the generation. They became higher and greater than the leaders of the tribes, as in the example of Rabbi Akiva. According to its root, Israel is Galgalta ve Eynayim, the easiest and purest desires that cannot absorb the Light of Hochma into them, whereas the nations of the world, when they receive this method from Israel and correct themselves, they discover a very great Light of Hochma. So, it is written, “If someone says that there is wisdom among the gentiles, believe it” (Eicha Rabbah 2:13) because it exists in a stage of correction. The nations of the world who attain the concept of “Israel” join the people of Israel to become a bridge for their people. Israel itself cannot become such a bridge since to do this it would have to become AHP de Aliyah, which is an ascent from below to above. So, it is imperative to disseminate the wisdom of Kabbalah to the entire world.